The scholarly research when read and commented by peers would enable creation of new knowledge. This knowledge when collaboratively sourced, reviewed and applied would develop new technologies for the public good. In this process, the scholars or researchers would get recognition, appreciation and citation by peers and promotions at work place. However, in the life cycle of knowledge creation and development of public good technologies, there is a considerable time lag and has issues about accessibility. Though the scholarly research is available, it is not accessible to everyone. Nevertheless, with the advent of new web 2.0 technologies, and licensing terms, all the researchers can now be able to sharing their scholarly research among peers globally in real-time and pave way for building upon their work for knowledge creation and technology development. Traditionally, the research work is first read at the scholarly conferences and is made available as conference proceedings and then the outcomes are published in the peer-reviewed journals. In this process, the work is evaluated by the peer review process for its credibility and upon publication as an article in a journal; the work gets sanctity and endorsement. 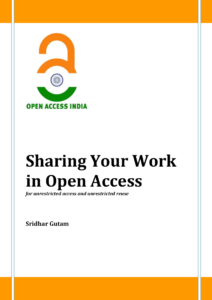 This module shall discuss about the ways and means of sharing the scholarly research globally via the World Wide Web and answer a few questions viz., Where to publish? How to choose a suitable journal? What is the journal publication process? In addition, how to share the published work? Click here to download the resource book.